April is officially national volunteer month. Volunteers are vital to every non-profit and they come in all shapes and sizes. According to the Corporation for National Community Service, 25.3 percent of Americans volunteer and the average volunteer in America contributes 32.1 hours of service each year. Non-profits rely heavily on the service of volunteers which is why they need to be recognized for their contributions. Being a volunteer can be a thankless job which is why there is an entire month dedicated to recognizing them. 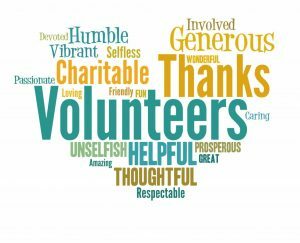 Volunteer recognition can be a powerful tool to keep volunteers engaged and prevent burnout. Most non-profits don’t have to have a big budget to recognize or appreciate volunteers. The good news is it doesn’t have to cost a lot of money to thank a volunteer. Never underestimate the power of a hand written note; getting something in the mail is a rarity. It shows the volunteer that you appreciate their efforts so much that you took the time to write a note. Thank you cards from clients, board members, or others who benefit from your programs can go a long way to appreciate a volunteers effort. A volunteer’s anniversary is a big deal and deserves to be celebrated because it demonstrates their commitment to your organization. The longer a volunteer has been involved, the bigger the celebration should be. You can even publicize volunteer anniversaries in your newsletter, website, or blog. Hosting a party is a great way to appreciate your volunteers. Bringing volunteers together not only collectively celebrates their service, but volunteers get to interact with one another and build positive energy surrounding your organization. Take time to get feedback from your volunteers on the effectiveness or your organization. This can be done formally through surveys or informally through conversations. Not only do they have a unique perspective on the organization, but taking time to solicit their feedback shows you value their opinions. Most likely they will have great ideas on how to make your organization even better.